We specialise in a type of needling called Trigger Point Dry Needling. This is a very effective form of needling, directed towards releasing the deep trigger points in the muscles. You will often feel a strong release in the muscle and notice an immediate improvement in your flexibility and movement. Dry needling is a method of releasing tight muscles, tendon and fascia, using very fine acupuncture type needles that are inserted briefly into the muscle. Specifically, the practitioner is looking for a trigger point which is the part of the muscle that has formed a contracted knot and limits flexibility. One of the goals of dry needling is to create a local twitch response in the muscle. This is the muscle contracting and releasing, with a subsequent release of chemicals from the muscle that were holding it in a state of tension. Using a fine acupuncture style needle allows deeper parts of the body to be accessed, leading to quicker resolution of symptoms. Dry needling is the first choice for many professional and Olympic athletes, runners and Cross Fit athletes who get huge benefits from dry needling, as opposed to regular massage and stretching. So how exactly does dry needling work? Generally you won't feel the needle being inserted. The local twitch response or sudden slight contraction of the muscle may provoke a very brief pain response. This has been described as an electric shock or a cramping sensation. A therapeutic response occurs with the elicitation of local twitch responses and that is a good and desirable reaction. Dry Needling is one part of our overall treatment experience. We treat you based on a thorough movement analysis. Often the cause of your pain is inefficient movement patterning so our treatment is holistic helping you to move more efficiently so you can feel better and perform at your best. The effects of dry needling gives us a window of opportunity with decreased pain and improved mobility, so we can start the important work of re-building your movement patterning and developing resilience. Each session involves some objective assessment and then some massage and joint mobilisation. This helps us get a feel for exactly where the dry needling will be most useful. The dry needling component can last anywhere from 5-15 minutes, depending on how many muscles we needle. What should I do after a dry needling session? You will normally feel achy after your dry needling session. This is a good sign that the muscle released. The best thing to do is to keep yourself moving and encourage the blood to flow throughout the whole body. You can use heat and/or a pain relieving gel to ease the soreness. How many sessions of dry needling will I need? Most people report positive changes from the first session and it takes approximately 3-4 sessions to release the muscle fully. We will recommend certain stretches and exercises on the foam roller to help maintain gains made during treatment. How fast the trigger points come back depend on your overall level of physical function, your type of work, diet and stress levels. We will educate and guide you towards a sustainable long term approach that gives you the responsibility to look after yourself. If you're a high level athlete and pushing your body to it's limits, you may benefit from maintenance sessions to prevent injuries from developing and enhance your overall performance. Dry needling is a very safe treatment. We use a ‘clean’ technique, and only individually packaged, single use, sterile needles are used. The needles are very fine (0.22-0.30mm), and very rarely does any bleeding or bruising occur at the insertion site. What sort of certification is required? In Australia, Physiotherapists must complete post-graduate training to be able to perform dry needling. 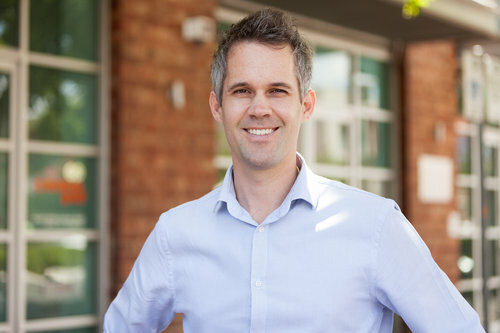 Physiotherapist Daniel O'Grady has over 10 years experience in dry needling and has completed extensive and advanced training in Australian Physiotherapy Association approved courses. Which muscles respond best to dry needling? Acupuncture is the ancient Chinese needling treatment based on chi and the meridians. It has a holistic effect on the body, helping to activate the parasympathetic nervous system. Dry needling is a Western approach, using the same fine needles, but directed specifically towards trigger points or knots in the muscles. Dry needling is much more direct than Acupuncture, and you will often feel the "twitch" of a the muscle being released. One of the benefits of dry needling is the ability to reach deeper parts of the muscle that are not reached during a deep tissue massage. If you would like to try Acupuncture, we highly recommend Equilibrium 4 Health. *If you're interested in trying dry needling, but are not quite sure about it (completely understandable! ), please book online or call us 1300 657 813 to arrange a free 20 minute 'discovery session' where we'll perform a basic assessment to see if you would be a good candidate for dry needling. We'll also show you in more detail about what is involved during a typical session (and help put your mind at ease). Dan O'Grady is a results driven qualified Physiotherapist and member of the Australian Physiotherapy Association. Dan has a special interest in treating pain and tightness arising from muscular trigger points. He has been working in private practice for 15 years. He is passionate about helping people to move better, feel better and get back to doing what they love.